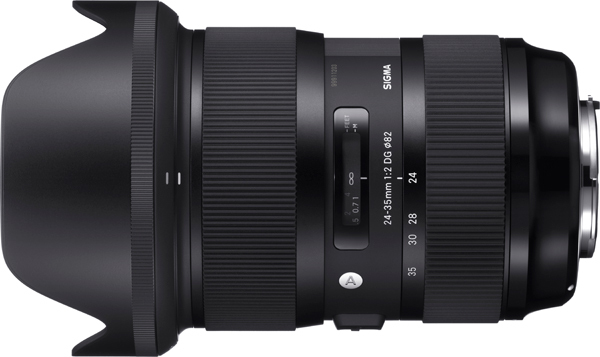 We’ve had news of the new Sigma Art HSM high speed wide angle full frame zoom – 24-35mm f/2. It will be available in Nikon, Canon and Sigma mounts only (release date not yet confirmed) according to Sigma in the UK. Note that this will be a bit of monster with its 82mm filter thread, 117mm long barrel and substantial petal lens hood. Sigma does not make a full frame DSLR. Sony is now a major market for high end full frame lenses. What’s going on here? We’ll just have to wait and see. Maybe Sigma just reckon every FF Sony mirrorless owner will have a Canon AF adaptor and maybe their HSM – which works pretty well on the A7II – will even allow fast AF on the new A7R II.